We remind you that in the official site you can find the past published issues, freely. We also remind you that the partners decide to assign the EPM Award 2009 contest with the same prize and the same rules approved for the previous competition in 2008, and that the voting to select the best article has been officially opened. be published in students sections, 14-16 or 17-19 only. arouse curiosity and be interesting to read. 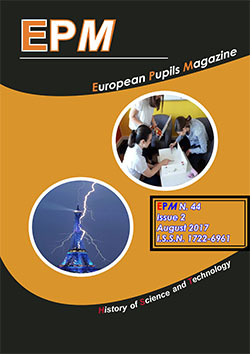 be on a topic useful in European curricula. The vote will be expressed trough the official website voting form, selecting the article to vote and filling the form with the requested information about the voter. To improve security, for voting will be requested a valid email address to validate the vote. Each student from a European Country has the right to vote once. 3 scores for a vote given by a person abroad the nation of the article author. The prize will be a flight ticket and family accommodation for one of the winning students and his/her teacher, to next EPM Project Meeting. Please, note that the competition is open to European students, only (Extra-European Russian Countries, not included). Give your opinion: vote now!